Sukanya Samriddhi Scheme, launched last month, is aimed at encouraging people to save for girl child's education and marriage. There is a new entrant in the small savings scheme category. Sukanya Samriddhi Scheme, launched last month, is aimed at encouraging people to save for girl child's education and marriage. It is part of the government's efforts to encourage financial inclusion and increase domestic savings, which have fallen from 36% of gross domestic product in 2008 to 30% in 2013. 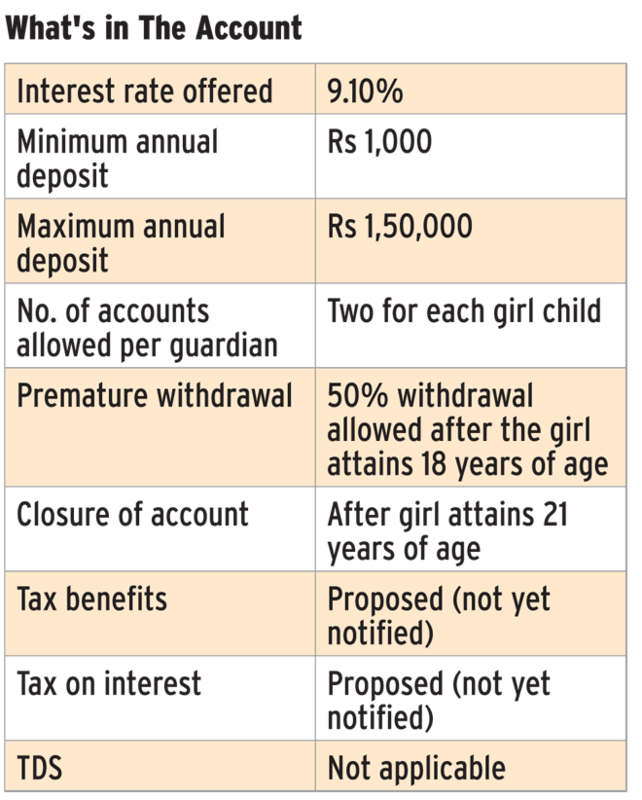 Under the scheme, parents and legal guardians can open accounts in the name of two girl children up to 10 years of age. However, as part of the initial offer, one-year grace period is being given. Now, any girl child born between 2 December 2003 and 1 December 2004 can have account opened for her till 1 December 2015. The account can be opened in post offices or scheduled commercial banks. The minimum investment is Rs 1,000 a year. Further investments have to be in multiples of Rs 100. The maximum amount one can deposit is Rs 1.5 lakh, irrespective of the number of accounts. One has to deposit at least Rs 1,000 every year. An account where the minimum amount has not been deposited can be revived by paying a penalty of Rs 50 and the minimum amount for each year during which the account holder has not paid. The scheme is offering an interest rate of 9.1% a year. However, the rate will be revised every year. The interest will be credited in the account every year. 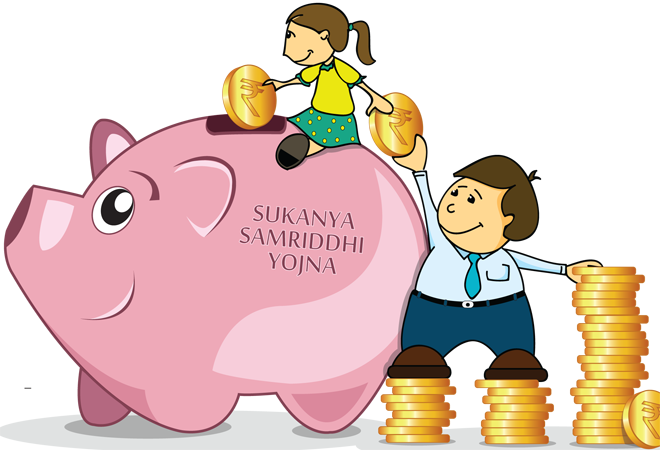 "The interest rate on Sukanya Samriddhi Scheme will be revised in April every year. However, the government is offering preferential rates. The scheme will continue to get preferential treatment," says A K Chauhan, joint director and head of department, National Savings Institute, which gives key inputs to the Ministry of Finance in designing, structuring and launching of new products. While the account can be opened only by natural or legal guardians, the child can operate it after she turns 10. Though the money in the account can be withdrawn only after the girl attains the age of 21, premature withdrawal of 50% of the amount at the end of the previous financial year is allowed for the purpose of the girl's higher education or marriage after she turns 18. If the money is not withdrawn even after the girl is 21, it will continue to earn interest. The account can be transferred anywhere in the country. The money in the account can be deposited through cash, cheque or draft. "While drafting the rules, the government has kept the fact in mind that many people in rural and semi-urban areas will be depositing money under the scheme and, therefore, has allowed cash deposits," says Anil Rego, CEO, Rights Horizon, a wealth management firm. The amount deposited is proposed to be eligible for tax deduction up Rs 1.50 lakh under Section 80C of the Income Tax Act. However, the government has not notified the proposal yet. A K Chauhan of National Savings Institute says, "We have proposed that not only the investment under the the scheme gets tax benefit under Section 80 C, but the interest earned should also be tax-free. However, both the proposal has to be notified by government." Finance minister Arun Jaitley had announced the launch of a savings schemes for girl children along with relaunch of Kisan Vikas Ptara in his 2014 Union Budget.